When isn’t a cell phone too big? 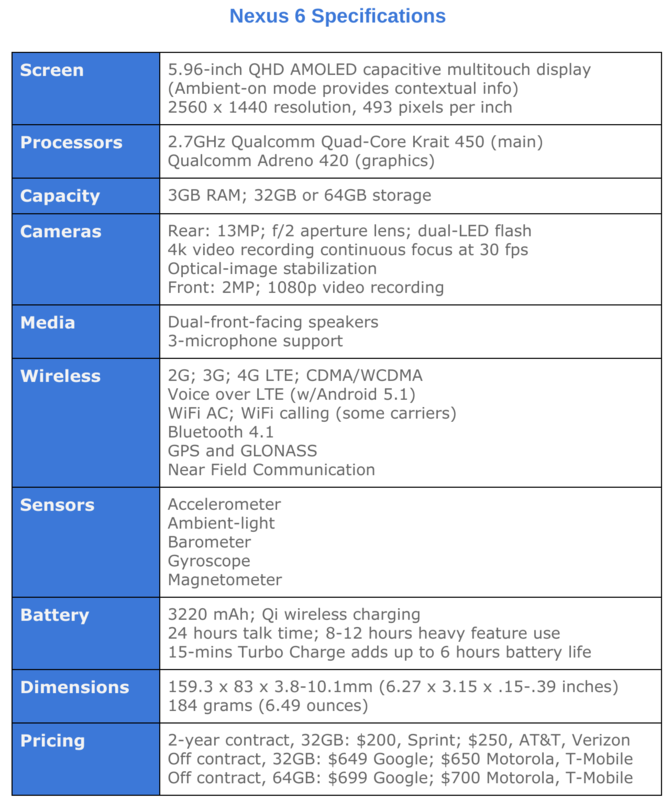 The Motorola-made, Google-branded phablet answers that question for me, and may very well for you. From Samsung’s introduction of the original Note, I scoffed at large-screen smartphones—and, honestly, the seemingly stereotypical gadget geeks using them. But big is better, and my arrogant attitude about phablets and the people buying them was unwarranted. Simply stated: Nexus 6 is the best handset I have ever used. The experience is so fresh and delightful, the emotional reaction reminds of using the original iPhone that I purchased on launch day in June 2007. N6 shatters my negative preconception about phablets, particularly unwieldiness when used daily. That said, I made some lifestyle changes, including choice of clothing, to accommodate the mobile’s massive size. The Apple handset is considerably more narrow when held in portrait orientation. Greater width means Nexus 6 fills more of the hand by comparison, but the dimensions better present content, which is a benefit best appreciated when comparing the devices side by side. Webpages look more natural, not as cramped, on the N6, and Android Lollipop’s Material Design strips back distraction, while emphasizing what matters. Some Notifications are stunning[/caption]Content consumption, and even some creation, is damn satisfying on the Nexus’—let’s be Mr. Spock specific—5.96-inch AMOLED display. Resolution is 2560 x 1440, and pixel density is 493. I thought the iPhone 6 Plus 1920 x 1080, 401-ppi screen was magnificent, until seeing Nexus 6. Colors pop and contrast is rich. I typically grab Nexus 6 before any tablet, and my mainstay slate is Nexus 9. Superior-quality display is but one reason. Most Android apps, and their notifications, are better optimized for the phablet-size. Magazines I used to happily read on iPad Air and grumpily consume on N9, such as Economist or Rolling Stone, are preferred on Nexus 6. Reading is immersive, text is razor sharp, and photos or video look fantastic. Streaming from services like HBO, Netflix, or Starz surprisingly satisfy. Summed up differently: Display size, resolution, and pixel density matched with the front-facing speakers and the phablet’s handling are finely balanced. The question everyone should ask before buying a cellular handset this large: Can I really bring it everywhere? Nexus 6 will fit in my back jeans pocket, which isn’t my preferred location. I wouldn’t worry about the shell bending there, which should be at least some concern with iPhone 6 Plus. Google unveiled Nexus 6 on Oct. 15, 2014, and sales started 14 days later. More than 5 months from release and following new, competing handset debuts during Mobile World Congress in early March, a belated N6 review seems untimely. But days ago, the phablet finally arrived on Verizon, and it’s the network I use. That’s news enough to warrant taking a fresh look at the phablet, with caveats: I use Nexus 6 on Verizon purchased from T-Mobile, and my phone hasn’t yet auto-updated to Android 5.1—and I worry that it ever will. Verizon sells the 32GB Midnight Blue Nexus 6, with Android 5.1 out of the box, for $249.99 with two-year contract or $649.99 without one. AT&T’s commitment price and duration are the same, but off-contract charges $682.99. Sprint asks just $199.99 on contract, or $648 otherwise. T-Mobile options are full price ($649.92) or 24 monthly payments of $27.08 with $0 down. However, Magenta also sells the 64GB N6 for $699.84 upfront or two-dozen $29.16 monthly payments. Android 5.0 is preinstalled by all three carriers, but they are in process of delivering 5.1 updates now. Apple deserves strange credit for my Nexus 6 interest. When I preordered iPhone 6 on Sept. 12, 2014, my intention was to use the device for the foreseeable future. But upon seeing and handling the Plus inside Apple Store, I realized the bigger phone wasn’t overly large as anticipated. But switching wasn’t an option during my 14-day buyer’s remorse period; Verizon sold out the Plus. Over the weeks that followed, the smaller handset’s appeal rapidly diminished the longer I used it. Then, in January 2015, I bought Toshiba Chromebook 2 on a whim, subsequently selling my MacBook Pro with Retina Display. With the return to the Chromie lifestyle, I considered going Android, too. My brief experiences handling iPhone 6 Plus made me wonder about the Nexus. On a Saturday evening later-month, I drove to the local AT&T store, which had the N6 on display. The size didn’t intimidate as I feared, while the screen screamed “Love Me” and the device felt very good in my hand. I could order from Magenta for use on Verizon because Nexus 6 is primed for all the U.S. networks, while being one of the most global-ready handsets sold anywhere. It’s my understanding—and I encourage someone to correct the information if inaccurate—that during initial setup there is some carrier customization depending on SIM card. I really don’t know what that means for my T-Mobile-purchased device on Verizon, if for no other reason than Android version—5.01 versus 5.1—during setup. I am anxious that N6 won’t update or what the consequences/benefits might be should it. First impressions using any device mean everything. Early emotions linger and affect perception beyond the first minutes usage. Manufacturers can pack in features and emphasize them in marketing collateral, but how they come together, how they balance, matters more. Features must deliver meaningful benefits, and among the most important—something that won’t fit on the box spec list—is joy. Does device A, B, or C make you feel happy? From cracking the box through the final setup, I smiled. I have used Android since Nexus One and all its successors since. Lollipop feels complete—mature—in a way unlike its predecessors. Android has finally grown up, and oh do I like the adult I see. The operating system and hardware feel tight; they are finely tuned and fit together much better than do iPhone 6 and iOS. Integration with Google services, like Now, expand Nexus 6’s utility. 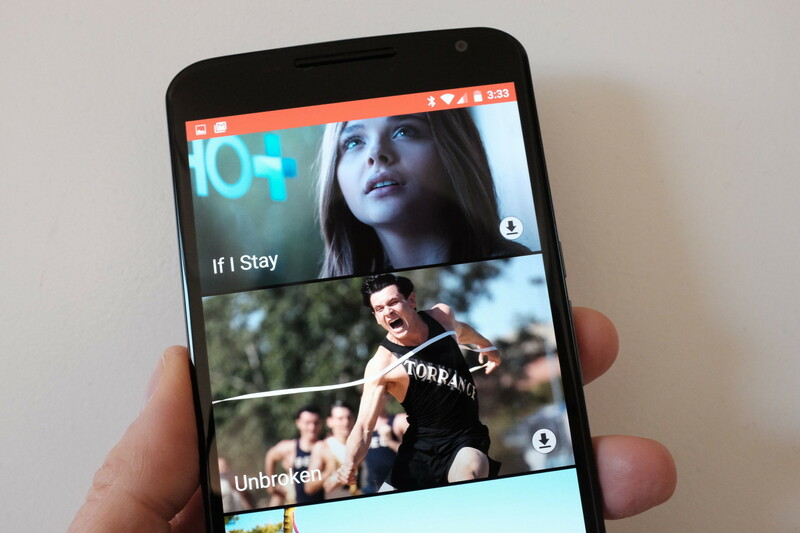 The visuals give good feeling using Lollipop, which unifies around concepts of Material Design. Google built from the Now card motif fantastically succulent user interface brandishing bold swaths of color. 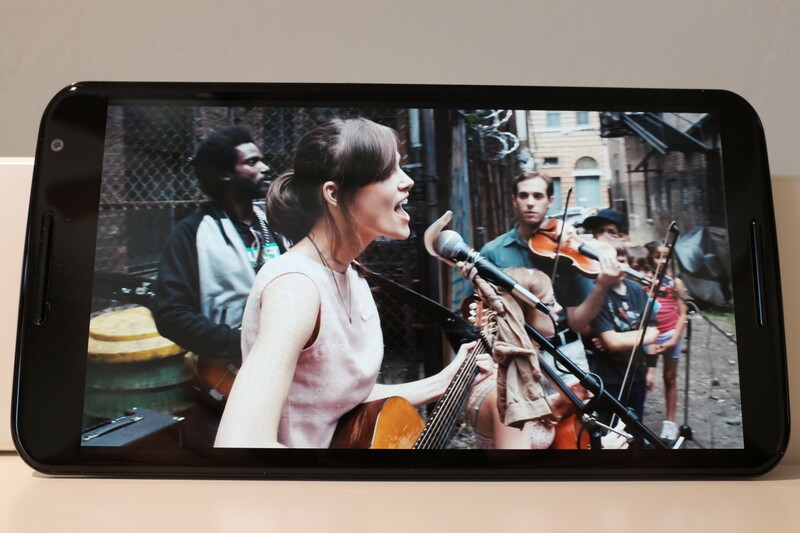 Feel-goodness explodes off Nexus 6’s pixel-dense ultra-HD display. The skeuomorphic user-interface design approach Apple popularized during the 1980s is an anachronism in 2015. Building on the familiarity of 3D objects made some sense during the early days of PC acceptance but has no useful benefit on websites or devices that use touchscreens; they’re 2D, not 3D. Lollipop and Material Design are flat with slight 3D touches that visually balance. Other joy-generating refinements: I use voice almost as much as my fingers to search web or phone, set reminders, dictate notes, and more. This capability, among many others, is behavior transforming. I started using the capability within the first hour after successfully logging in. Google Now Launcher’s default home screen placement encourages voice usage in ways Siri on iOS doesn’t. 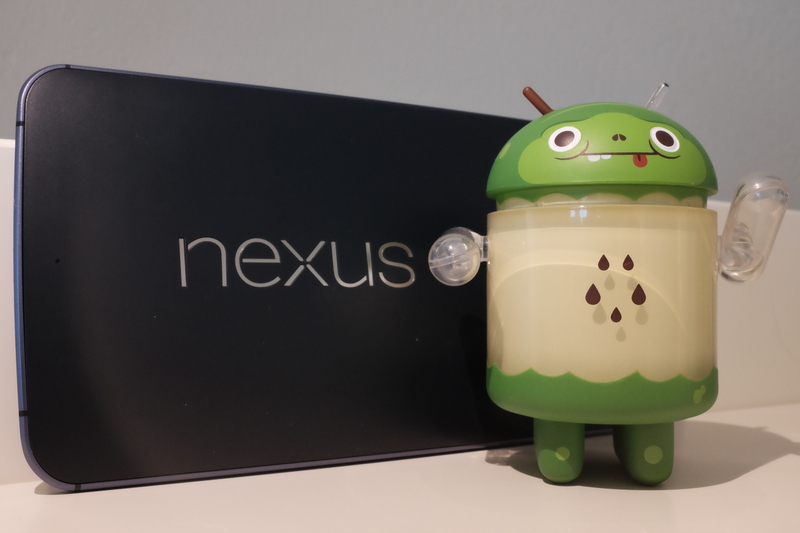 Two months have passed since I bought Nexus 6, which is more than enough time for comprehensive, meaningful evaluation. Here’s my problem presenting it: There is nothing I dislike about the phablet. The device is perfect for my needs, and it could be for you, too. I emphasize this, because complete satisfaction is a first. Every other handset, no matter how beloved, had some failing; if not many. Nothing surprises me more about Nexus 6 two months in, and none of the newer handsets, such as HTC One M9, Samsung Galaxy S6, or S6 Edge, tempt me. Call quality is superb (on Verizon; I can’t speak for other carriers). Battery typically lasts longer than 24 hours, for me, perhaps half that with heavy use. Fifteen minutes on the charger adds another 6 hours, by Google claims. I see something typically less but more than enough top-off. Contextual consumption is the point—the underlying design philosophy that makes Nexus 6 exceptional. If you hadn’t noticed, this review is organized differently than every other I have written. It’s more free-form, rather than check-listing features and benefits. That’s because Nexus 6 is an experience. That is a contextual consumption, and some creation, experience. Context is core to Google’s corporate cultural DNA. Search, and the advertising business model built around it, is all about context. Where context matters most is the mobile device you always carry, by providing what is meaningful to you anytime and anywhere as what you need changes based on situation, or location. N6 delivers balanced features—battery life, camera, connected services, operating system, screen, wireless, and more—packaged in a device large enough to carry and enjoyably consume content contextually. But I am skeptical that Google can achieve such greatness again working with an independent OEM, which Motorola wasn’t when this device was developed.